Carrier operations in FSX – which carriers and aircraft should you install and how to find a carrier in the middle of the ocean. Freeware guide. My first serious carrier flight was in the Fleet Defendera. Back in 1990s it was advertised as the most realistic naval flight sim with unprecedented carrier operation simulation. I have not completed a single flight. I was not a complete newbie at this time. I clocked hundreds of hours in Air Combat and received nearly all medals in F-15 Strike Eagle III. I was a capable F-16 pilot in Strike Commander. But the Fleet Defender was a different animal. For the first time I had to read the whole manual to be able to fly it properly and being eleven – I gave up. Later I tried to go back to FD but the graphics scared me off. My next encounter with naval aviation started when I discovered 1942 Pacific Air War. To be honest – I preferred to fly from land bases than from carriers. And I found the option to end my missions before landing very helpful. But after some time I managed to master carrier landings in Zeros and Wildcats. It was the Top Gun Fire at Will that made me really love naval sims. Like many other PC simulation games in the 90s – it was a story based game/sim. Short movies at the beginning of each flight featured real actors – including James Tolkan who played the CAG in Top Gun the movie. Additionally – Top Gun Fire at Will boasted the best graphics of all aviation related games I had by this time. Today you may laugh watching this minecraft-like terrain but back then – it was a breakthrough in terms of mesh design. I spent countless hours flying F-14 in the Top Gun Fire at Will and learned how to land it on the carrier. Later came Pacific Fighters from the Il-2 series. I was flying Wildcats and Corsairs again – with much better graphics and realism than in 1942 Pacific Air War. And then was the Flight Simulator X! Flight Simulator X introduced carrier operations in Acceleration expansion pack. Steam Edition and P3D also include this feature but if you really want to enjoy flying from carriers – you need to install several add-ons. If you have the old FSX SP2 (without Acceleration) you need to download FSX Carrier Operation Package (version – 3.0 or higher). Acceleration and Steam Edition users do not have to download or install this add-on. I use Acceleration and SE and I can not tell you how Carrier Ops Package works. In this text I will describe modern aircraft carriers only. If you are interested in historical carriers – send me a message – I am considering writing a guide. I listed only the best add-ons that I have personally tested. There are several other carriers available. Before you download five or 10 ships – get the Nimitz and give it a try. It’s the best freeware carrier available. 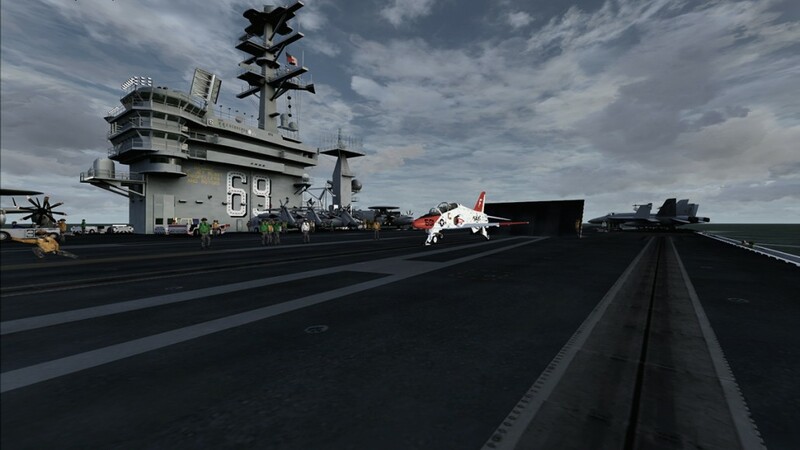 You will get the nuclear aircraft carrier (actually two carriers – Nimitz and Ike) in 12 different aircraft and crew setups – from empty deck to the carrier that is packed with planes. Some of the configurations include UH-60 helicopter flying nearby in case you crash and need to be picked out from the sea. If you need more – France had a strong carrier fleet and you can choose any of their carriers used in last decades – Charles de Gaulle and older Foch & Clemenceau. You should also check out the Gauge RFN version 4.1 – if not for the gauge itself than for the manual that explains how the “ball” works – it’s the carrier optical guidance system. If you like the Royal Navy more – go for the Ark Royal. It’s available in “Phantom-friendly” version – equipped with catapults and arresting gear. For Harrier fans – there is a modern version with ski-jump ramp. Victorious is also available. If you chose Nimitz – AI Carriers software is included and already configured for the Nimitz. Otherwise – download and install AI Carriers tool. I strongly recommend using Nimitz to install both. How does it work – in “Add-ons” menu of your FSX you will wind “AI Shops” that will open on screen menu with ship selection. Using this menu you will be able to choose the ship and it’s position (relative to your location). Later you will be able to use this menu to ask for ship’s position and order it to turn, stop or go ahead. FSX SP2 users need to install FSX Carrier Operation Package first. FSX Acceleration and Steam Edition include F-18 Hornet. I find it mediocre. I tested several payware and freeware planes and with the notable exception of Aerosoft’s F-14 (read my 6-star review) – the freeware planes were far better!!! I should also mention payware VRS F-18 Hornet that I have not tested – but it seems very good. The name you should become familiar with is India India Alpha Foxtrot Echo. Dino Cattaneo publishes marvelous freeware planes for FSX. His F-14 is much better than payware F-14 by Iris (some say it looks better than Aerosoft’s F-14 but I do not agree) and his F-35 and T-45 are both of payware quality. Viking was in development when I tested it and there was not much work done on this plane since – the F-35 is the priority at the moment. T-45 has no payware competition and looks like a payware plane that would get 4-stars in my reviews (provided it was not too expensive). It’s a great training aircraft in the real world and in FSX. F-35 is surprising – with the complicated glass cockpit it looks like a performance hog but it’s not. I have not flown it too much but from what I read – it’s worth to give it a try. P3D allows to use it’s full potential as some features are impossible to recreate in FSX. Viking has performance issues – I hope that Dino finds time to improve it. I tested a payware A-6 from Razbam. It’s a nice plane from the outside but in terms of cockpit and flight dynamics it needs an update. For me it’s a 3-star plane – “for fun”. I like to play with it from time to time (A-6 is one of my favorite naval planes in real world). There is also the Buccaneer from Flying Stations, VRS F-18 and some F-4s. Currently only the F-18 is on my wish list. I consider buying F-4 from Milviz but I am not convinced yet. In an F-14, T-45 or any other aircraft that is fast, you need a hook to catch carrier’s arresting wires. The default keyboard shortcut in FSX (Acceleration or Steam Edition) is Shift+Q. To launch your plane using the catapult you need to taxi to the catapult. In some planes you may need slew mode to be able to reach it and position yourself correctly – press Y. Then you need to lower (extend) the launch bar (Shift+U). it will be attached to the catapult after you press Shift+I. Then set your flaps, run your engines at full power (with afterburner if possible) and launch (Shift+Space). There may be a bug in some carriers or planes that will cause aircraft forward motion at full power when attached to catapult. In such cases – try what power settings will keep you in place (usually around 60-80% power) and move your throttle forward once you launch. Carrier operations in FSX - which carriers and aircraft should you install and how to find a carrier in the middle of the ocean. Freeware guide. Magnetic Variation Briefing – where to find charts and procedures?